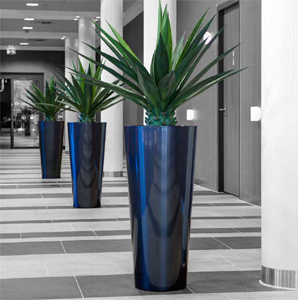 Art en Vogue Planters by Artstone. Supplied by Ora Home Ora Home Ltd. The Art en Vogue range is fashionable, contemporary and above all stylish. The products are made of lightweight polymer, which has been finished manually with high-quality lacquer polish. This finish ensures a modern look of the lightweight material. 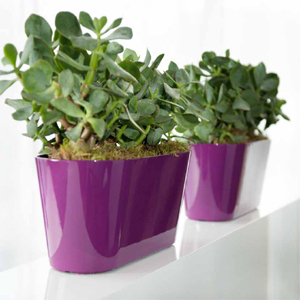 The series is available in a range of shapes and sizes and is produced in various mesmerizing trendy colours. Art en Vogue has been developed for indoor use, but the finish is such that all products are also suitable for outdoor use. 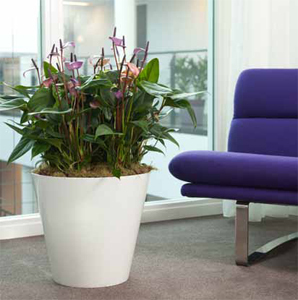 All Art en Vogue products feature a unique drainage system, which ensures that plants will never be drenched in too much water. The result is a series of products that is not only a feast for the eyes but is also handy and practical to use. We have added convenience to a trendy look. All vases from the range can be ordered with an inlay. The inlay fits the vases exactly to ensure that it is visually inconspicuous. When the inlay is used, the vases do not have to be filled fully with sand, which makes them practical to use and perfect for indoor use. open for the excess water to drain off. We have over 20 products in our Art en Vogue range.